Last week, I was in Ft. Collins, Colorado with a team of six students participating in the National Collegiate Landscape Competition. 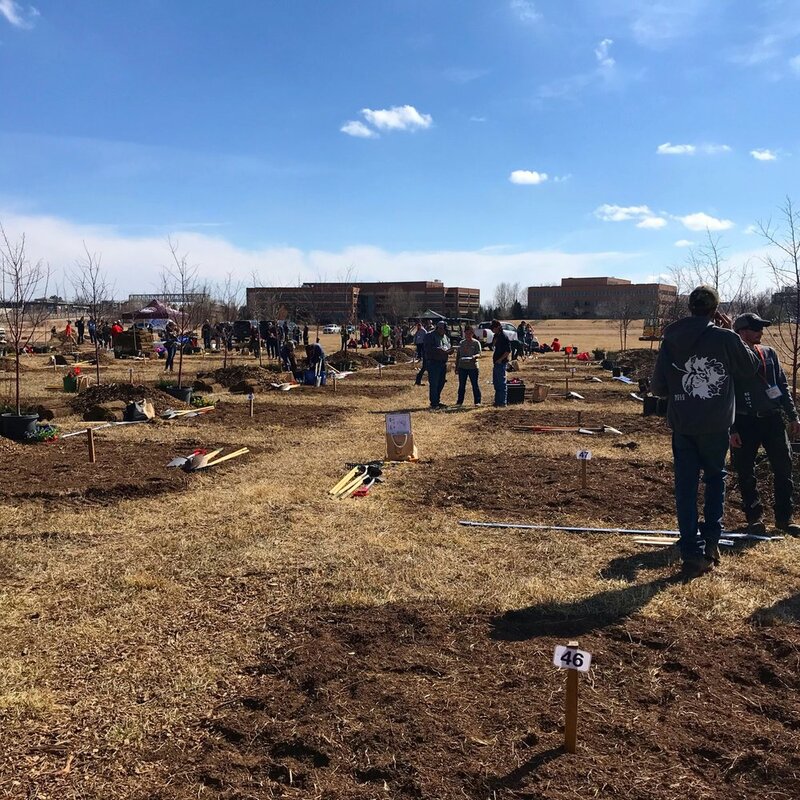 It may surprise you that there’s actually a competition for students to practice around 30 different horticulture skills including hardscaping, bench building, and driving a skid steer. I know it did me when I first heard of it years ago, and surprise is usually the reaction I get when I tell people outside of horticulture where we go. This opportunity is an incredible chance for students to really spread their roots into the green industry. The competitions require undergrads to practice skills before they arrive, and the career fair challenges them to engage with industry leaders. As a professor, it’s inspiring to see so many different companies present and willing to help students. I believe that it’s one of the best events for students to attend. Oh, and I guess you want to know if we won anything! Anna Claire won best student for the social media competition, I won the faculty social media award, and the school won the overall social media award. In all it was $2000 cash, $500 in Permaloc edging, and $500 in Corona tools. Below are some pictures I took from the event. If you aren’t familiar with the competition, check it out and consider helping a local team in your area! Sam Hill Tree Care, Benchmark Landscapes, and Yellowstone Landscape supported our team and allowed us to do more at the competition. Hardscape installation! Our team qualified for the first time this year. In this contest, students have 1 hour and 50 minutes to install a patio. There’s also arboriculture where students can show off their climbing skills. The last contest of the event is landscape installation teams of three have two hours to install a planting to spec. And, here we are on stage winning the social media contest! If you want to see more pics from the competition, check out our @sfahorticulture Instagram page. This semester, one of the classes I’m teaching is herbaceous plants, and I’m taking the class beyond the usual discussions of annuals and perennials. From studying herbaceous plant communities, one of the most useful concepts that I’ve learned in recent years is the classification of a plant’s survival strategies. I’ve written about it before here and here. As a refresher, Grime pitched that plants had three strategies based on environmental factors. COMPETITORS are plants that take advantages of any and all resources they can muster. They grow tall and wide to take out the competition. Usually these stalwarts are perennial in nature, and they grow where stress and disturbance are nil. STRESS-TOLERATORS are plants that have adaptations to ensure survival when stress arises and conditions deteriorate. They are usually perennial and can take many years to flower from seed. RUDERALS are short-lived annuals or biennials that are frequently exposed to some type of disturbance, which has selected for plants that quickly produce seed. Usually, this strategy is visualized using a triangle (much like the soil texture triangle!) where a certain species can be shown to be—pulling some numbers out of the air—say, 70% competitor, 20% ruderal, and 10% stress tolerator based on the characteristics they exhibit. A figure of Grime’s triangle from Pierre et al. (2017) titled A global method for calculating plant CSR ecological strategies applied across biomes world-wide. As you can see the authors attempted to classify plants across the globe based on their tendency to be a competitor, stress-tolerator, or ruderal. How do you take this concept from theory to application for students? Much research and data collection is needed to be able to precisely place a plant on the triangle. Can it be done in a more simple fashion? After we covered the CSR theory in class, I did an activity with students. I gave small groups (three to four) a list of seven different herbaceous plants and asked them to look up information and pictures online and try to determine where on Grime’s triangle it would fit. I drew a triangle on the board labeling the sides and gave them markers and half sheets of paper for writing plant names. I then challenged them in pin-the-tail-on-the-donkey fashion (no blindfolds or sharp objects though!) to figure out where on the triangle the species would go by searching for it online. Students looked for tendencies to spread, cover large areas, form large clumps, and/or have rhizomes (COMPETITOR); tendencies to produce copious amounts of seed, occur in areas of disturbance, and/or be short lived (RUDERAL); and tendencies to live in a stressful habitat, take a long time to flower, and/or have storage organs (STRESS-TOLERATOR). One by one they started coming up and making educated guesses. I stood by the triangle to offer advice and suggestions. Some hit the nail on the head while others needed a little bit of coaxing to the right place. At the end, we went over the 20 or so species I provided as a challenge. Again, I explained that while some species neatly fit into one group, some straddle the fence like Liatris elegans. It has a corm (a stem-derived storage organ indicating some level of stress toleration) yet produces copious amounts of seed (traits of a ruderal). Pin the plant on the triangle—a fun game to teach students about plant survival strategies. Based on your plant knowledge, how do you think they did? As gardeners it’s very helpful to think about flora in this way. It helps us anticipate how plants will perform. It explains why Gaillardia and Aquilegia don’t live long as perennials (ruderals), why Mentha and Monarda spread like crazy (competitors), and why Trillium and Narcissus take 3–7 years to flower from seed (stress-tolerators). It also allows us to envision how to combine plants. Maybe put that runaway competitor in a drier spot to keep it from taking over creation? Or, sow some ruderals in between the stress-tolerators to keep weeds down. If students can decide approximately which section of the triangle plants fit in during a 15 minute activity using search engines, then we can by watching how plants grow over the course of a year. So, that’s your homework for the season. Draw a triangle and see if you can’t plot where the species in your garden fit. This weekend, it was my turn to help out with Showcase Saturday, an opportunity for high school students considering SFA to come check out our school’s diversity of majors. When I’ve assisted in the past, we have at most two or three students come up to our agriculture department booth and ask questions about our horticulture program. I expected the same turnout. They came with questions about our program, what we offered and how we were different from other universities, and what career opportunities were available after graduation. Not all of them knew the word horticulture. Some came saying they were interested in growing plants or hydroponics. After my amazement wore off from the constant stream of students interested in growing plants, my analytic scientist brain switched on, and I started asking questions such as how did you even hear about horticulture, a word that normally has low recognition amongst youngsters. The common thread was high school opportunities—classes for horticulture and/or participating in floral design or nursery competitions in FFA. These comments helped to support a trend I’ve seen of more and more high schools offering horticulture classes and doing greenhouse projects. (Even mine back in Tennessee built a greenhouse right after I left!) I would like to see some hard data, but I think there’s something there. Time will tell if they actually decide on horticulture as a major, but the students’ comments reminded me of what I’ve been preaching. For people to engage with horticulture and plants, they have to come into contact and imbibe the wonder of plants or else this potential passion in many students may lie dormant. Yes, we have to accept not every seed is viable. Even Aldo Leopold realized, “There are some who can live without wild things and some who cannot.” I believe the same dichotomy applies to encouraging an interest in plants and even pursuing a career in horticulture. But, visiting with the students this weekend reminded me we must be present and keep reaching out to those that love the wild green things in anyway that we can, even if their love hasn’t germinated yet. It did in me, it did in you, and it will in them.